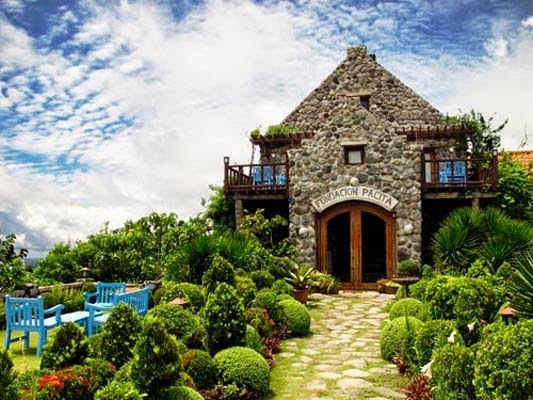 Fundacion Pacita Batanes Nature Lodge is one of the famous resort in the idyllic town of Basco. The lodge features magnificent wonders of Batanes and picturesque landscaped gardens that will surely be loved by everybody. It provides guests a very enticing and romantic lodging. Fundacion Pacita is the home studio of internationally-acclaimed artist Pacita Abad, and was changed and renovated by her brother, Butch Abad, former DepEd Secretary. Mr Butch is behind the concept of this nature lodge which decorated with masterpieces from various artists. Each rooms boast narra wooden flooring and wooden furnishings and houses several kinds of arts by both famous and rising new local artists. Some art pieces were donated by distinguished artists in the Philippines. Inside room, you can find air conditioning, hot and cold water, mini-bar, private toilet and bath, view deck and others. The hotel resort has premium suite, terrace suite, luxury terrace suite, family loft, and family suite-mountain view. Facilities and services of Fundacion Pacita Batanes Nature Lodge include airport and city transfer assistance, Car rental service for tour, massage service and a restaurant that serves sumptuous dishes to satisfy your cravings for delectable Ivatan cuisines. The fastest way to get to Batanes from Manila is by plane. There are local airlines that offer flights Manila to Batanes and vice versa. Travel time takes 1 hour and 45 minutes. From the airport, tourists can ride a taxi at the terminal to tour the province.